I’m so glad to back to writing after another hiatus. My break from writing is not due to any change in how often or how intensely I think about my mom. I should really keep track of the number of times I read (in books, magazine/newspaper articles, other blogs, etc.) sentiment similar to mine: No matter how long my mom has been gone (now 20 years), she is very much a part of my daily existence. 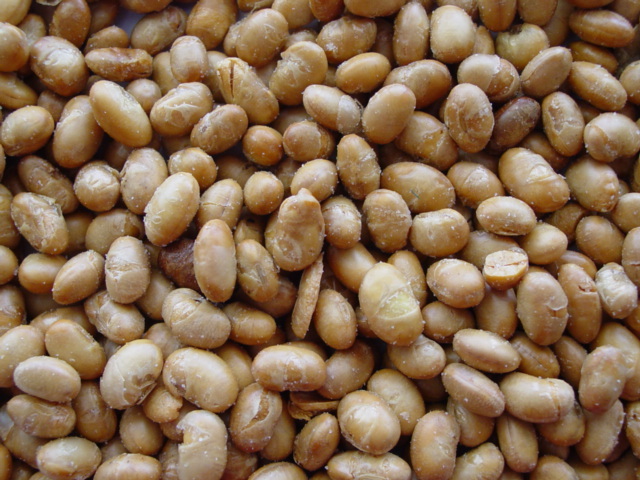 And, so when I saw a recipe for roasted chickpeas recently, http://bit.ly/chowcpea, I felt compelled to write about my mom’s roasted soybeans. Back in my July 7, 2011 post, http://wp.me/p1lBgS-3K. I wrote “As I have become increasingly obsessed with quinoa, I keep flashing back to the time that my mom first roasted soybeans. It was 1980: I had just turned 16 and she had just quit smoking. To help herself, she became vigilant about not smoking and living a healthy life.” It is true that her healthy snack made me very sick since, at the time, we did not realize that my peanut allergy extended to most legumes, including soybeans. If you have ever smelled freshly roasted soybeans, you will recall being coerced into eating a handful simply because of the aroma. So, as I ate her fresh-out-of-the-oven salty soybeans, my mouth felt the typical allergic itch and I soon realized that “healthy” or not, this snack would be placed on my tantalizing and inedible list. For me and, I imagine, for most daughters (and even sons), our mom’s food interests and cooking are some of the most memorable, inspiring and even eternal connections we have to her. Recipes are often passed down to many generations. I have written about and, even more importantly, passionately spoken to my children about my mom’s specialties. It’s not just her secret for sweet chicken soup (parsnips), but the meals we shared and obsessed over that help keep her in my everyday thoughts. And, just as I am writing this, I realize that yet another recent experience brought back warm and delicious food memories. My family spent a few days in NYC over this past Christmas holiday and after the typical Christmas movie outing, we stopped into the TickTock Diner. My daughter ordered and relished their French Onion Soup (without the glutenous bread). I immediately reminisced about the lunch my mom and I shared during a day we spent at the Metropolitan Museum of Art. We each ordered their French Onion Soup and, either because we were starving or because it truly deserved the accolade, we rated it the best we’d ever had. Soon after, my mom topped theirs by making her own. She even served it in the classic crock-bowl. So, after we got back home from our NYC adventure, I found a recipe, bought the ingredients and made the new best French Onion Soup my family has ever enjoyed. This brings me to ask YOU and hopefully help you recall some of your mom’s special recipes or delicious food adventures you shared with your mom. Please share! I wish my mom knew how much her wisdom still inspires me. While I did not have the chance to admit to her that she was right about the tan (and obviously still need to be reminded), I think that she must have seen my powder cover-up as a sign of guilt and acknowledgement. Of all the things I wish my mom was here for, being a grandma to my children tops the list. She would have kvelled constantly. I often think of how much pleasure she would have had from being their grandma. Fortunately, I did get to witness the wonderful relationship she had with my nephews from birth to age 5, when she died. She was thrilled with everything about them. I must have had this on my mind when I was walking through Livingston Mall the other day. I spotted a few young girls walking with women who appeared to be grandmothers and immediately thought of my mom. As much as I wish my mom was here to do that, I’m not sure she would have. She did like to shop, but usually in an antique store and/or with a mission or purpose. She was never a mall walker or window shopper. Unlike her, I am. I love to wander through the mall especially during the summer when I have more free time. Later in the week, I observed more girls and grandmas strolling in the Mall at Short Hills. I imagined they had finished lunch and were carrying bags of clothing they chose together. Some held hands—forcing me to smile at their special moment. So, I wonder, what activities would (or does) your mom enjoy with her grandchildren? Does she take them to the mall? Museums? Parks? Did you engage in similar activities with your grandmother? Just as I did during my mall trip, I’ll live vicariously for a few moments.